The weekend prior to Abby's bachelorette party (details coming soon!!) we hosted a 90's themed party and I absolutely loved how it turned out! My husband and I loved going to his themed date parties back in undergrad and jump at any chance we get to have theme parties with our friends here in Seattle. 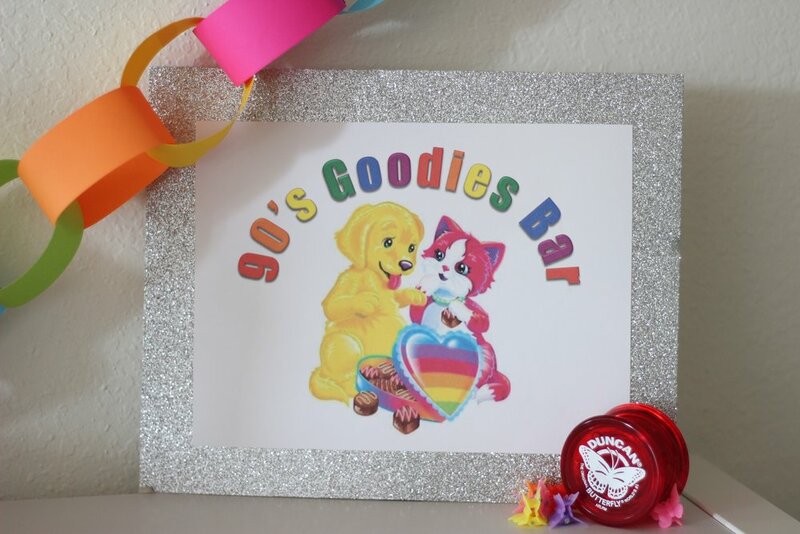 As soon as we found a date that worked for everyone (that residency life is no joke, it took 2 months) I started ordering so many nostalgic goodies that I ended up making an entire 'goodies bar' to share with everyone. All of the goodies were from Amazon or Etsy and included Tamagachi's, mood rings, yo-yo's, butterfly clips, gel pens, plastic balloons, tattoo necklaces, stick-on earrings, and of course slap bracelets. I then crafted the link paper to hang all over the ceiling, pulled together a little '90's Goodies Bar' label (I had to include Lisa Frank somewhere), and used tape to draw out the 'S' symbol that was doodled on every notebook I owned back in elementary school. Finally, I printed out a bunch of MASH games that I found on Studio DIY's blog which were a surprisingly big hit, especially in combination with the gen pens. The whole night was filled with nostalgia and everyone went all out with their outfits, it was seriously one of my favorite parties we've hosted! See some live videos of the decor in our Instagram highlights @clockingoutblog and stay tuned for lots of bachelorette goodies coming soon!